The highest quality organic, natural, FDA/USDA Human Grade food for your four-legged family member. 5 Stars: “Amazing and can’t say enough about how much my little critters love their food. So healthy and they deserve the best!! !” – Stacy S.
Prepared pet food became popular around 70yrs ago and has really exploded in the last 30yrs or so. Before then dogs and cats thrived on raw meat, animals they caught, foraged, or food scavenged from humans. Their digestive systems haven’t had time to evolve to efficiently consume today’s dog food. After WWII, in response to the tremendous increase in consumer appetites, the human food industry created vast quantities of waste from slaughterhouses, grain mills, and processing plants. Pet food manufacturers – still in their infancy — immediately understood the unlimited opportunity of human food waste to their industry. By 1960, pet food companies had figured out how to mass-produce dry pet food to meet growing consumer demand for pet “convenience” foods. As the pet food industry grew larger and more influential, the biggest manufacturing companies have sown fear of raw and more healthy foods through their nutrition spokespeople to vets, who then pass that fear along to their clients. 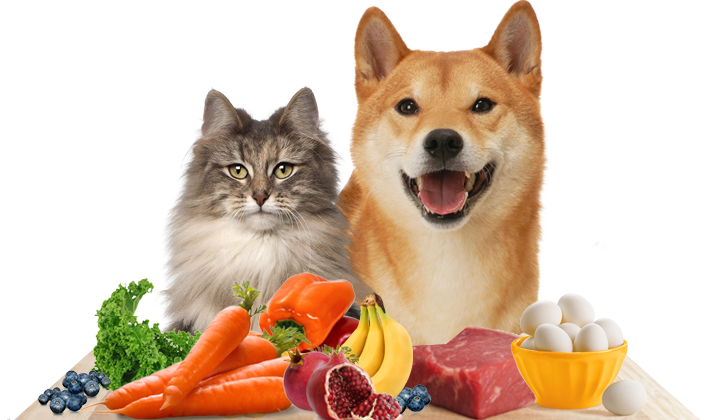 To be optimally healthy, dogs and cats need whole, fresh, moisture-rich foods. They don’t need grains, fillers, artificial preservatives, colors, additives, chemicals, excessive processing, or byproducts. All of which are found in the vast majority of today’s pet foods. Although animals can eat some processed foods, they aren’t designed to consume a lifetime of dry or canned diet. Many pet food companies use the lowest cost ingredients even if the first ingredient listed is a protein like chicken. This includes downed or sick animals rejected for human consumption, left-over bits and pieces. Ever wonder why canned food has those perfect meaty looking chunks? Yep, meat scraps that can’t be sold to humans are formed with grains to fool humans into thinking the food is healthy. That’s the complete opposite of what we do at Fetching Foods. We purchase whole, organic, non-GMO ingredients from quality grocery stores and distributors. All of our ingredients are FDA rated for human consumption. Then we use minimal processing to maximize the nutritional value of the meal. We never use fillers, preservatives, sweeteners, grains, soy, gluten, artificial flavors or colors, or anything you can’t pronounce. We won’t feed your pet anything we wouldn’t eat ourselves, and we’re food snobs. Our recipes are carefully designed for species-appropriate nutrition based on the latest science and confirmed through certified lab results. This is how we can produce what is possibly an ideal meal for a dog or cat. And we make it delicious. In short: the best ingredients to create outstanding nutrition, and the least amount of processing, means a super-healthy meal for your pet s/he will gobble down. Sudden health issues typically take a long time to develop and are triggered by assaults on your pet’s bodily systems. When these assaults become too much for the body to handle, disease manifests. When you remove food from your pet’s diet that sabotages their health and replace it with fresh, wholesome nutrients you’ll likely notice that astonishing improvements appear rather quickly. Clearer eyes, shinier coat. Persistent scratching may suddenly vanish, stubborn extra pounds may fall off. A more alert, spry-er, and generally happier pet may emerge. An added bonus is 90% of the food they eat is digested so the amount of pet waste is drastically diminished — more time for you rather than cleaning up. You might consider keeping a journal to track the progress of the new diet. Spend your money on quality pet food rather than vet bills. You’re likely to have a happier, healthier pet for a longer period of time by feeding them Fetching Foods. You can’t put a price on more time with your pet — they’re here for a short time. If you’ve ever lost a pet, any extra time is priceless.